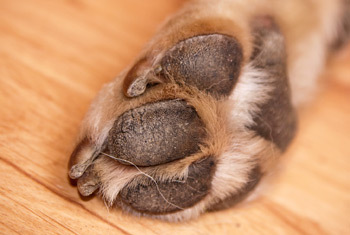 A dog’s paw is like your foot. They vary in size from tiny to very large depending upon the breed. Some dogs are natural swimmers. Their paws are specialized and are webbed. This gives them greater ability to swim. A dog walks on its toes like a horse – not like a human who walks on the soles of his feet. Each paw has four pads on the ground. The pads provide both traction and shock absorbent ability. As the dog ages, the pads become rougher helping them to do quick turns and run better. 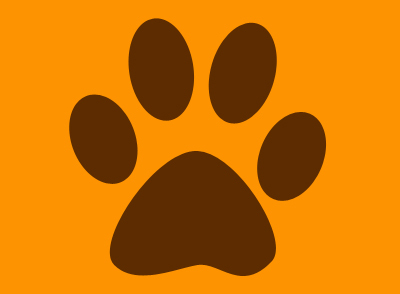 The paw has one large heart-shaped pad (metacarpal pad) in the center and four smaller pads that actually carry the weight of the dog (digital pads). Higher on the paw is a smaller pad called a carpal pad. This is sometimes used to get more traction or helps in stopping. Do you know that dogs sweat through their pads? 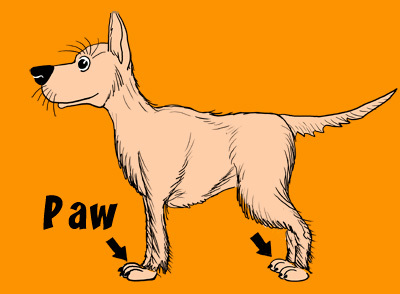 The dog's front paw has five toes; one of them is the dewclaw. It is high up on the paw and is many times thought not to be needed for the health of the dog. Because of that, it is often removed by a veterinarian when the dog is a puppy. The dog's hind paw has four toes; there is usually not a dewclaw on the hind paw. The toes have claws which are similar to our fingernails. They need to be trimmed regularly so that the dog walks correctly and maintains good health. It's all a part of good dog grooming.